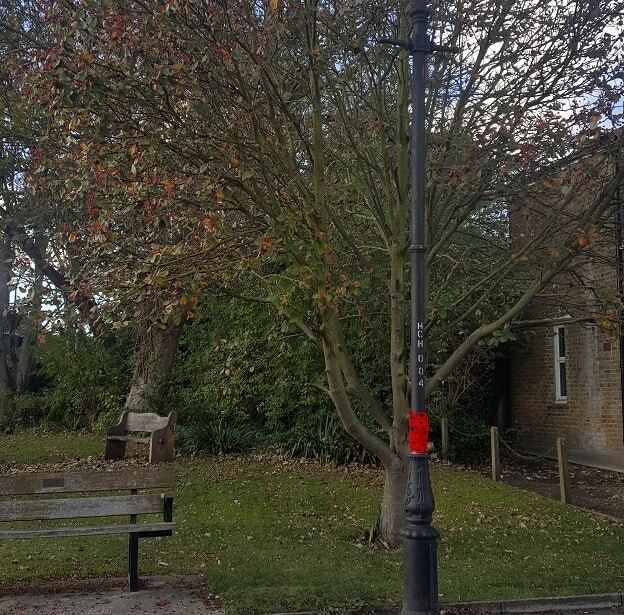 Hundreds of hand-knitted red Remembrance poppies are decorating Minster village. The crocheted symbols in memory of those who have fallen in conflict and who continue to fight for their country adorn lampposts, gates, and fences from the top of Tothill Street at the entrance of the village down along the High Street towards St Mary’s Church. The town sign in the heart of the village has a giant poppy at its base, while homes and business are flying patriotic union flags. Outside the cemetery a giant message spelled out in woollen poppies is featured on hedges either side of the main gates, spelling out the Lest We Forget message and the date 1918-2018 to mark the centenary of the end of the First World War. Inside the cemetery by the war memorial stands the silhouetted figure of a solitary soldier by a simple cross framed by two giant poppies. More than 17,000 red, purple and white poppies have been knitted by volunteers for the 100 Armistice anniversary project. The flowers were then sewn together for the displays. Congratulations to all involved in this poppy installation. A marvellous tribute of remembrance. Well done Minster. What is Ramsgate doing? Thank you for your appreciative comments. 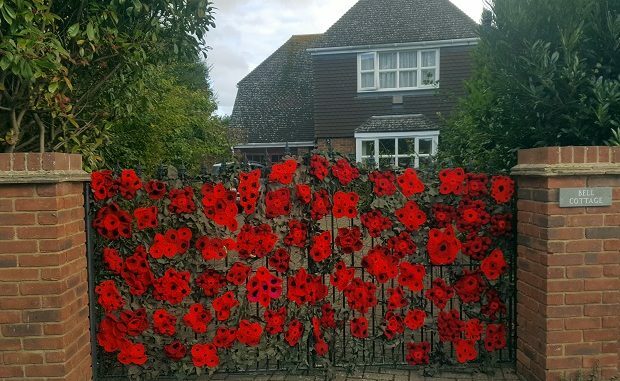 This was the brainchild of one woman, who called for 17,000 poppies to be knitted and/or crocheted in order to create a display for the 100th anniversary of the end of WWI. Minster responded and during the last 18 months the target has been reached in order for the displays to be created. 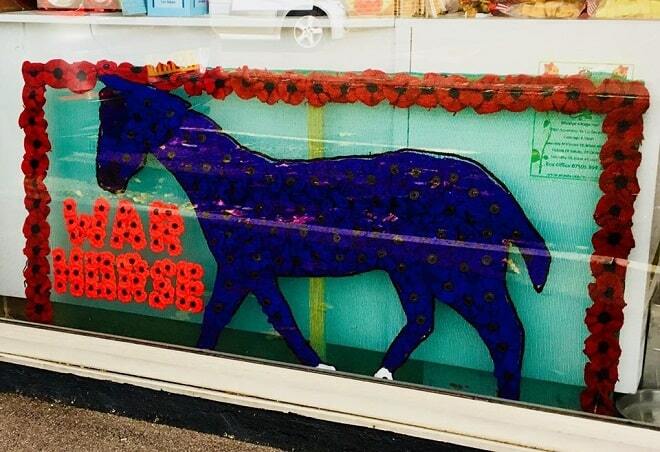 The last phase of the project should be completed tomorrow (31 October), when ribbons of poppies will cascade from the church roof and the Lych gate, walls and memorial garden of the church will also be festooned. 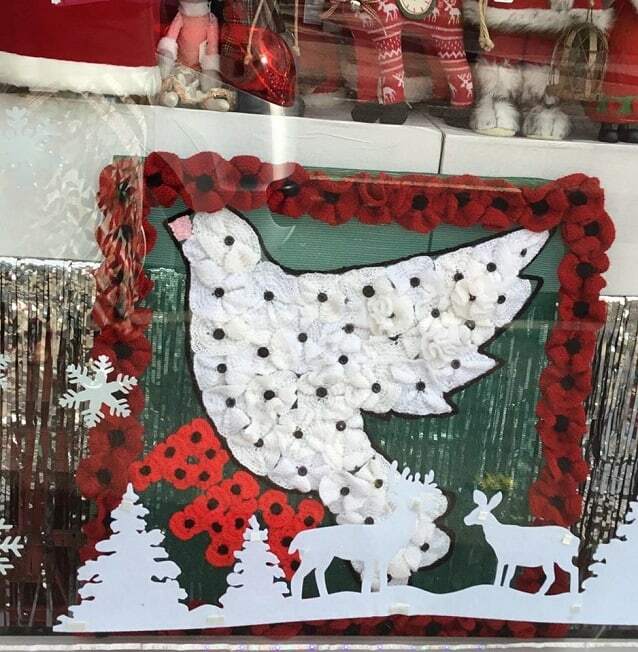 If anyone comes to see the displays in the village may I suggest that you could make a small donation to any Royal British Legion collection box. Many thanks. PS Glad that you like our gates.